75 Avenue/Queens Blvd is a local stop along the Queens Blvd Line, it has a full length mezzanine that is still open completely (except for a tiny closed fenced off section at its eastern end accessed from a single closed staircase on the Manhattan-bound platform) like most of the rest of the stations along the line. The mezzanine has the split with no free transfers between the different directions set-up. There are staircases to street level at either end, to 75 Road (a single streetstair to the SE corner) or 75 Avenue & Queens Blvd to the NW and SW corners. The entrance from the northwest leads to a little tunnel before the mezzanine beneath the north lanes of Queens Blvd with a Pedestrian Underpass because the station is more situated over the southern lanes than northern. The token booth in the center of the mezzanine in the central corridor outside of fare control between the two banks of turnstiles each for the respected directions, nowhere near the exits to the street which are at either end of the station. The center mezzanine is separated from the areas within fare control by a cheep looking chain link fence like many Queens Blvd local stops have. Towards the ends of the mezzanine near the exits high exit turnstiles provide a closer means of egress from the station. While entering passengers for Manhattan-bound trains only can enter at a High Entrance Turnstile (and use a TVM) here. The color scheme of the station's side platforms is green trim with green borders around the name tablets and the columns painted lime green color. This station also has 75th Ave signs on the beams between the express and local tracks. 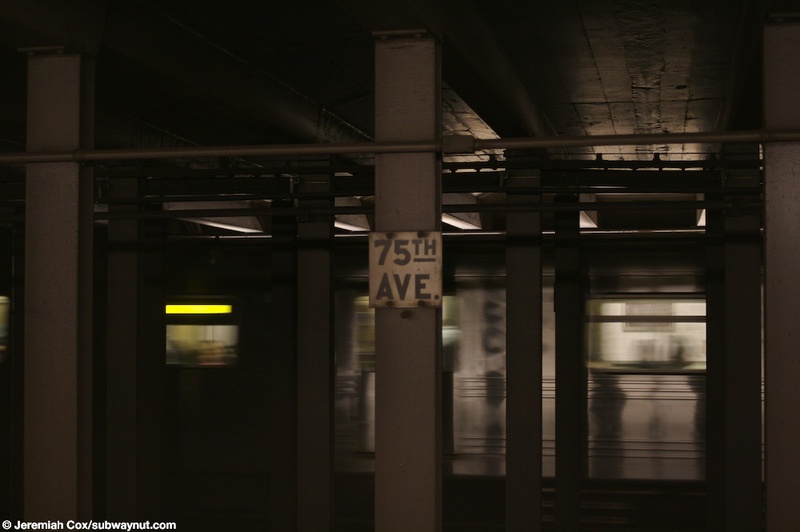 (75f1) The back of a Manhattan-bound R46 F train stopped at 75th Avenue, the old 75th Avenue sign on the beams between the tracks is visible. 2 June, 2008 (75f2) Another view of the back of a Manhattan-bound R46 F train stopped at 75th Avenue, this time with the platform and it's lime green colored columns visible. 2 June, 2008 (75f3) A 75th Avenue name tablet with its light green border. (75f5) The 75th Ave tiled text a tile width below the lime green trim with a black border. 2 June, 2008 (75f6) A close up of the 75th Ave text. 2 June, 2008 (75f7) A view of a closed staircase up to the mezzanine at 75th Ave.
2 June, 2008 (75f8) Looking down an empty Manhattan-bound platform at 75th Ave.
(75f9) A sign along the inside fare control portion of the Manhattan-bound portion of the mezzanine for the two different exits to 75 Road & 75 Avenue (Its queens, there two different streets a bock away from each other, don't ask!). 2 June, 2008 (75f10) Another view down the Manhattan-bound side of the mezzanine at 75 Avenue. 2 June, 2008 (75f11) A view of the turnstiles in the center of the station from the Manhattan-bound side of the mezzanine, nowhere near an exit to the street. 2 June, 2008 (75f12) A view of the High Entrance/Exit gates to the 75 Avenue exit, this means passengers don't have to walk the equivalent of 1/2 way down a platform length to find turnstiles to enter the system. (75f13) A close up of a high entrance gate and a high exit gate at 75th Avenue. 2 June, 2008 (75f14) A mosaic sign outside of fare control for 75th Ave/N Side Queens Blvd. 2 June, 2008 (75f15) Another view down the Manhattan-bound side of the mezzanine at 75th Avenue, the cheep-looking chain link fence painted white that separates it from the area outside of fare control is visible.